Today we transfer you to the historic town of Kanchanaburi. Here you'll visit the famous bridge over the River Kwai along with World War II cemeteries and the local War Museum. After lunch your afternoon if free to explore this interesting riverside town or just relax and soak up the atmosphere. This morning we head into the nearby Erawan National Park. Where you'll spend the morning exploring the lush jungle, which is home to more than 300 species of bird life. After lunch you can either relax at the camp or spend the afternoon getting to know the local flora & fauna, before returning to base camp for a cold drink and a hot shower. After dark we'll explore the nocturnal side of the park. It's an early start this morning and as the forest slowly wakes up, we’ll be quietly climbing into our nearby tree platform for a view all the way to the Burmese border. The platform is a great place to see some of the resident great hornbills and other canopy birds, and get a bird’s eye view of life in the forest canopy. From here we’ll also be able to hear the fascinating and complex calls of one or more gibbon family groups in the area. Afterward breakfast you'll trek deeper into the jungle in search of other interesting flora & fauna. After a packed lunch and some time to relax you'll make the leisurely walk out of the forest for your transfer back to Kanchanaburi. In the morning you'll have the opportunity to visit a local Mon village. Here you can see the local villagers in their colourful traditional dress and observe some of their simple day to day lives. Later in the afternoon we will transfer back to Bangkok, where the evening is free for you to enjoy Bangkok’s lively nightlife. We start today with a cycling tour of the countryside around Bangkok. You'll visit the Kamalulislam mosque, hub of the local Muslim community, ride along canals glimpsing the life of local Thai families. You'll visit fish farms, rice mills, traditional Thai wooden houses and there will be plenty of time for birdwatching, before arriving in the old market town of Nong Chock. Here we trade your bikes for boats and complete your journey with a river cruise down the Saen Seab canal. Early this morning we take you to visit one of Bangkok's most colourful floating markets in the Kingdom at Damnoen Saduak, a district in Ratchaburi Province. En route you'll stop to see how home-made palm sugar is produced. After the market we drive to Wat Don Wai, an old community with a lively street market and Wat Raiking, which is famous for its holy-water and fish sanctuary. After lunch we visit a hand-made ceramics works, famous for its five-colour Benjarong ceramics. Originating in China these traditional designs were very popular around the mid 19th century. In the evening, we transfer to the train station to board the overnight sleeper train to Surat Thani, in a second class, air conditioned, sleeping berth. After breakfast we transfer to the Raja Phraba Lake and travel by boat to our accommodation for the night - raft houses, floating on the lake. 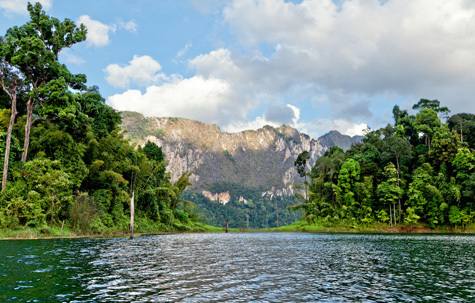 After settling in and taking lunch, we will take a boat trip for a 2 to 3-hour hike to a wonderful vantage point giving a dramatic and panoramic view of the lake and surrounding jungle. After dinner you can take a guided walk to observe the natural nightlife of the rainforest. It’s an early start today for a longer hike into the jungle to observe and learn more about the local flora and fauna. We’ll view local wildlife, giant trees - some with huge buttress roots, wild orchids, ferns and much more. We then return to the raft houses for a late lunch and the rest of the afternoon is free to relax. Various options are available to swim, or go tubing on the river. The morning is free for you to relax and enjoy your natural surroundings in the park. After lunch we provide a private transfer back to Surat Thani for the overnight sleeper train back to Bangkok. Your morning is free to relax after you train journey and to settle into your hotel. After lunch we take you on a boat tour of some of the many canals that criss-cross the suburbs of Bangkok. Along the way you'll visit markets, a school, temples, an orchid farm and the Royal barge house. The evening is free for you to enjoy at your leisure. Your morning is free to do some last minute sightseeing or shopping before we transfer you back to airport for flight home.